Whether you’re looking for materials for your next DIY project, beginning the process of building your dream home, or a contractor with a customer that needs to see samples before committing, we are here to help. At our showroom, you will be able to see all of our products on display with plenty of colors and styles to choose from. Our design experts will walk you through the process from start to finish, helping you explore all of your design options. We are here to help your dream project become a reality. Are you inspired to bring your design dreams to life but don’t have the technical know-how to do so? Bring your ideas, sketches, and dreams in and talk with one of our experienced designers. Our highly skilled dream weavers will help bring your designs to a code-compliant reality with blueprints and material lists. Our goal is to make the process as fun and exciting as it can be for you. Windows and doors are the focal point of every home. They must strike the perfect balance between elegance and energy efficiency. With our wide variety of color, style, brand, and design options in windows and doors, your perfect match is just waiting for you. Are you unsure of what will work best in your home? Our experienced design staff is ready to help you every step of the way from picking out colors to exploring various style options. Also, with our wide variety of windows and doors on display in our showroom, you can get a real-life idea of what it will look like in your home. Are you ready to create the outdoor living space of your dreams? Our decking and outdoor living design experts at Frontier Home Products & Design Center are ready to get you started. No deck is complete without the finishing touches, though. From gorgeous lighting options to elegant railing packages the options are limitless and all at your disposal. Is your kitchen in need of an update? Are you unsure of where to start on a new-home kitchen design? We have extensive color and style options to choose from that are sure to bring your dream to life. Also, our experienced sales and design staff is here to help you through the process from beginning to end. From design ideas, to blueprints, to product selection, we are here for you. Not all fireplaces are created equal and no two fireplace designs should be the same. At Frontier Home Products and Design Center you can walk through our full-room fireplace display and imagine the many possibilities for your custom fireplace layout. Choose from EPA Approved natural Wood fire places, Pellet Stoves, direct vent or vent free gas. Also, with our gourmet grill line we can help make your outdoor kitchen dreams come to life. The possibilities are endless and the end-products truly spectacular. 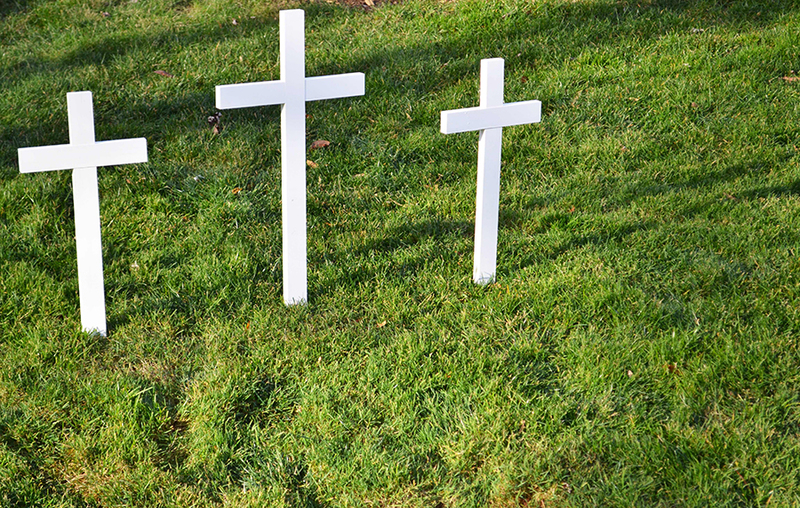 The center Cross of course represents the cross in which Jesus Christ died for the sins of all mankind. From this Cross flows Forgiveness, Mercy, Grace and Eternal Life – to all who will receive. The outer crosses represent 2 criminals. One who was full of pride, bitterness and a hardened heart. The other criminal on the cross was humbled by the presence of Jesus Christ next to him. His heart was softened as he acknowledged the Lord and His Kingdom. This criminal took ownership of his sin and simply asked Jesus to remember him when He came into His Kingdom. “Today you will be with me in paradise,” said Jesus. Wow, what a promise and Jesus always keeps His promises! Truly this criminal experienced Victory in Jesus. 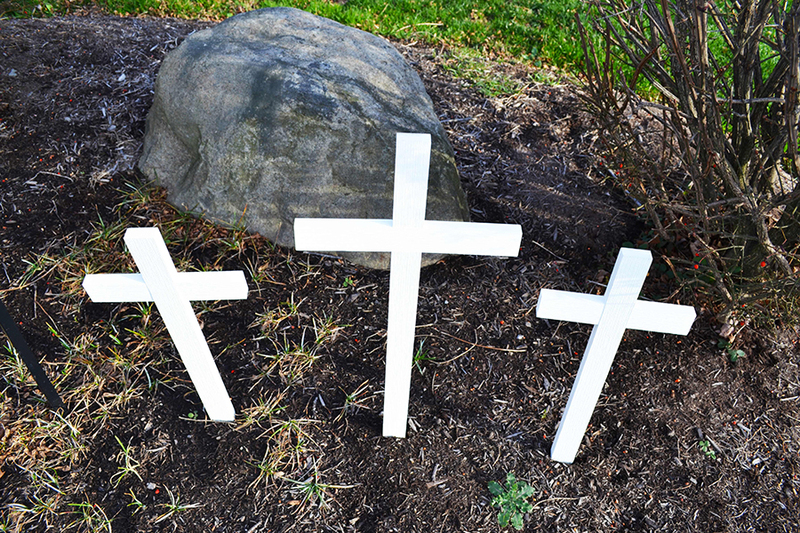 So when a friend asks why you have 3 crosses in your flower garden, tell them your story. 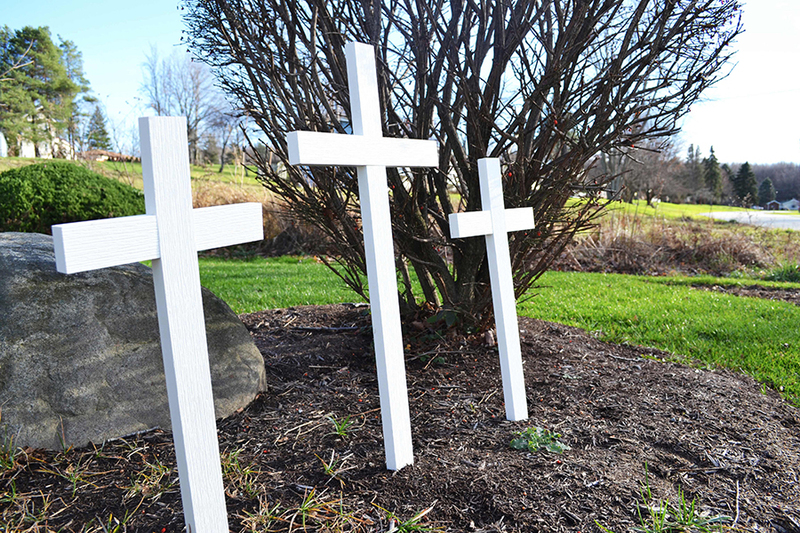 You can purchase the crosses locally at either of our locations for $12.00.